In this paper, we consider a variety of models for dealing with demand uncertainty for a joint dynamic pricing and inventory control problem in a make-to-stock manufacturing system. We consider a multi-product capacitated, dynamic setting, where demand depends linearly on the price. Our goal is to address demand uncertainty using various robust and stochastic optimization approaches. For each of these approaches, we first introduce closed-loop formulations (adjustable robust and dynamic programming), where decisions for a given time period are made at the beginning of the time period, and uncertainty unfolds as time evolves. We then describe models in an open-loop setting, where decisions for the entire time horizon must be made at time zero. 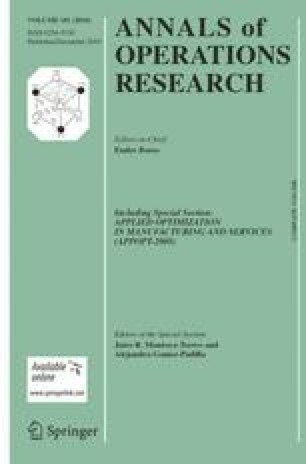 We conclude that the affine adjustable robust approach performs well (when compared to the other approaches such as dynamic programming, stochastic programming and robust open loop approaches) in terms of realized profits and protection against constraint violation while at the same time it is computationally tractable. Furthermore, we compare the complexity of these models and discuss some insights on a numerical example.